The modest rebound in the US Dollar currency continued yesterday and this appears to have been sufficient to depress silver prices down along with spot gold on a day when copper too was hit by a bout of profit taking. 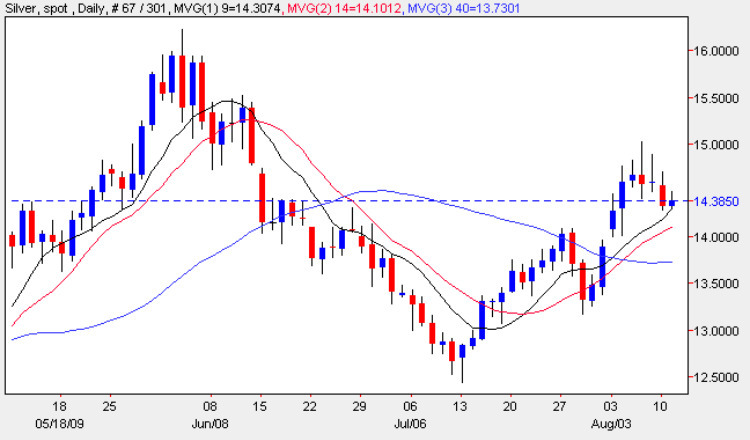 Overall spot price silver lost a total of 26 cents to settle at $14.330 per ounce but did find a modicum of support at the 9 day moving average. From a technical perspective the silver chart is still looking mildly bearish although when compared with the gold chart it is certainly not exhibiting the same strong bearish signals which has seen the price of gold fall very sharply over the last two gold trading sessions. Whilst yesterday’s candle on the silver chart ended the session in a downbeat mood the price action was contained within a relatively narrow range, and somewhat surprising following the previous week’s three shooting star candles. In other words despite the technical picture silver prices are managing to hold up rather well and appear to have found some support from the 9 day moving average. Finally with the markets now waiting for the outcome of the two day FOMC meeting the best we can hope for silver prices a firm signal once this meeting is over. The short and medium term sideways while the long term is bullish.